I am 5?7?, 165 lbs. I ride a Giant TCR for road, a Specialized FSR XC M4 S-Works for MTB, a Kona Smoke, Ibex Corrida, Xootr Swift and an Ibex Xray for my commute. I am avid cyclist that enjoys all sort of riding. I am also a bike commuter traveling 20 miles round trip. The mean streets of L.A, and the San Gabriel River trail. Overview: The KHS Latte is 1 of the 2 folding bikes featured on the KHS line up. The Latte is a singlespeed, it’s geared twin, the Mocha is a 6 speed bike. 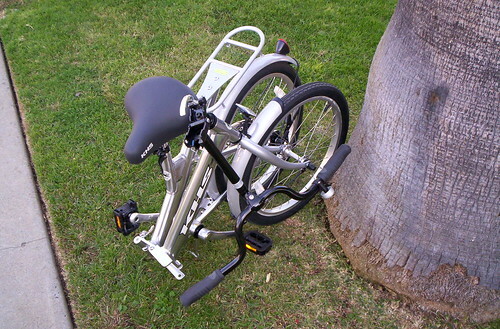 The Latte folds fast and easy, it also has a under-frame stand that allows the bike to stand up while folded. The Latte also comes with a built-in rear rack, hard to find stock on a foldable bike. I do have a thing for fenders, and yep, the Latte comes with a nice set, the rear fender has a nice reflector that makes the bike look somewhat classy. As for the ride goes, the position is very comfortable and the handling is rather nimble. What I didn’t like about the bike: The singlespeed set up is a 44tX18t matted to 20″ tires. That meant a lot of spinning to get the bike to ‘commuting’ speed. The bike topped out at about 12 mph on the flats, which added an extra 25 minutes to my 8 mile commute. The other thing I didn’t care for is the coasting brake, It took me a while to get used to it. This is the first time I get a flat while commuting on any of my bikes. Fortunately, I was carrying a 16mm wrench. The Latte does not come with quick release skewers which made the process of changing the tube somewhat time consuming. At $219 MSRP, the Latte is an inexpensive foldable bike for cruising, short trips to the store, and VERY short commutes. The Latte doesn’t suit my commuting needs, maybe if it had a gearing of 44tX16t, a front brake and quick relase skewers it has the potential of being a decent foldable commuting bike. I had the pleasure to experience the Latte for a bit. This bike is perfect for going to Starbucks, the store or pedaling around the neighborhood. This is actually perfect for college students. It’s affordable can be used to get from one class to another. I should do reviews for CbB. I’ll happily review any rad free gear anyone wants to send me. I just noticed the bike behind the Latte…poor fella has a flat.